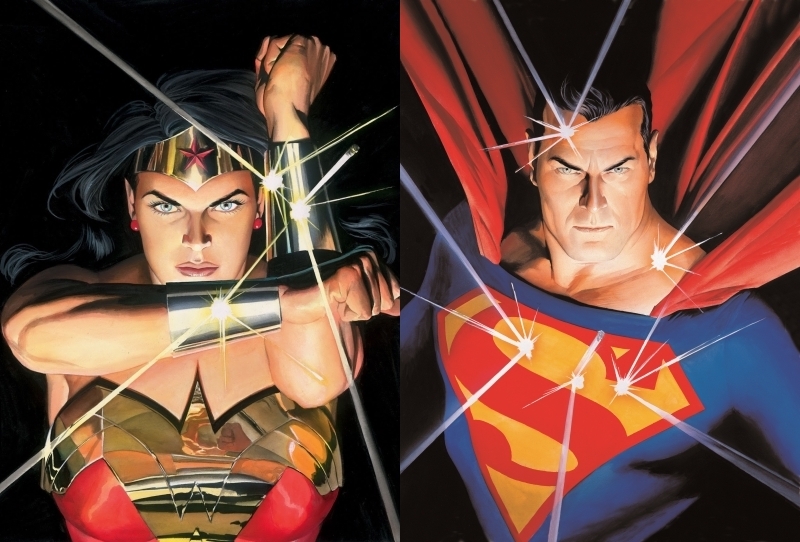 Wonder Woman and Superman are bulletproof, compared to the rest of us. The rest of us have to be brave and strong. Minnesota is a very gunny state. Half the state has enough guns for the entire state, plus a few. Despite the armaments, a recent StarTribune poll found that 9 out of 10 people in Minnesota believe mandatory criminal background checks should be part of all gun sales including purchases made at gun shows (90% agree, 8% disagree). And 63% of Minnesotans support raising the legal age to buy a gun from 18 to 21. Isn't consensus weird?!? Not that consensus will change laws (not this year), or that laws will stop every single villain. Society has to change to find heroes, not just to intervene when trouble occurs, but also to intervene before trouble occurs. Superman doesn't want the bad guy's gun. He'll duck it every time. Over eighty years ago, the comic book format changed from reprints of newspaper strips to original content. Original content was More Fun and more like the adventures in the pulps. Pulps were like serialized, short paperback books on newspaper paper. In 1938, a new comic book was being created by the people who published Detective Comics. They contacted a logo maker for pulps named Ira Schnapp to make the logo for Action Comics. The result is above. 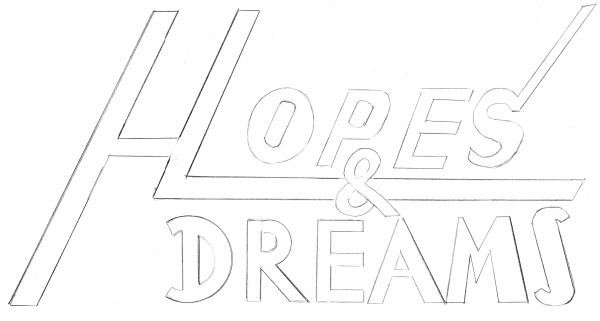 A way to understand how tough it was for Ira to create the Action Comics logo is to get out a pencil and paper and trying to mimic the logo with original content. Superman started in Action Comics #1 that year. This week, Action Comics turns 1000. The time is 2:44pm as Flight 101 lands at Metro Airport. 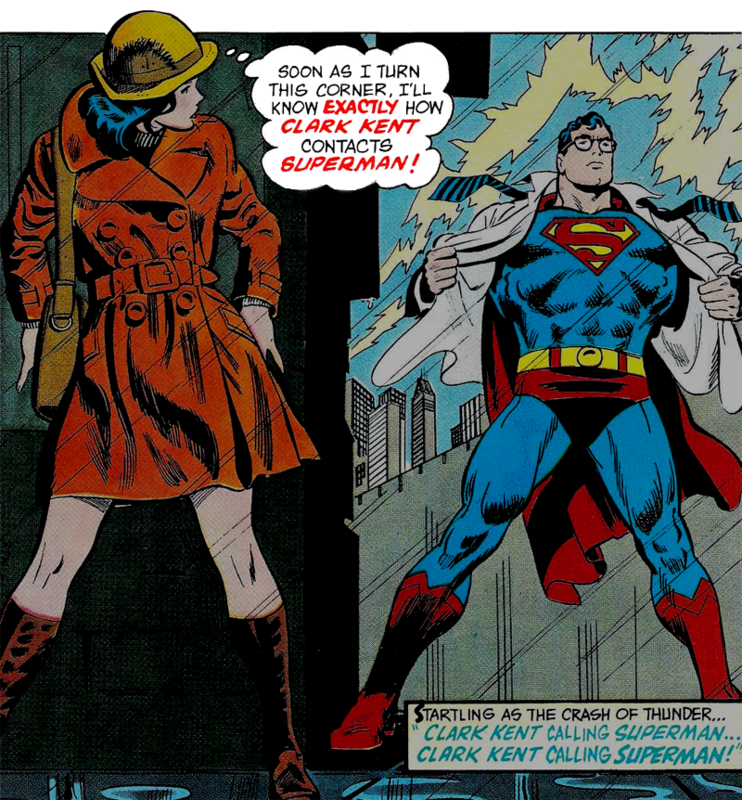 While collecting their luggage at baggage claim, Lois Lane and Clark Kent receive a page (like a publicly announced text message) telling them a helicopter is waiting to pick them up. The copter pilot says, “Say, Mr. Kent... The word is you got a special knack no one else seems to have. They say you're the only person who knows how to get in touch with Superman when an emergency comes up!” The pilot jumps from the helicopter. Our action hero in lime-green, Lois Lane, springs into the pilot seat, saying, “Don't go into your panic routine, Clark. I've got a pilot's license for these things.” Clark notices the rotor-blade has flown off its sprocket. Lois discovers the controls aren't responding. Clark kicks a hole in the floor and cushions their landing with a blast of air (um, physics?). Lois Lane never sees the hole in the floor. She provides a convenient explanation about Clark contacting Superman. She states, “You are the only person who seems to be able to call Superman.” Hilarious. Lois Lane probably has more specialized yells for calling Superman than Minnesota has types of snow. 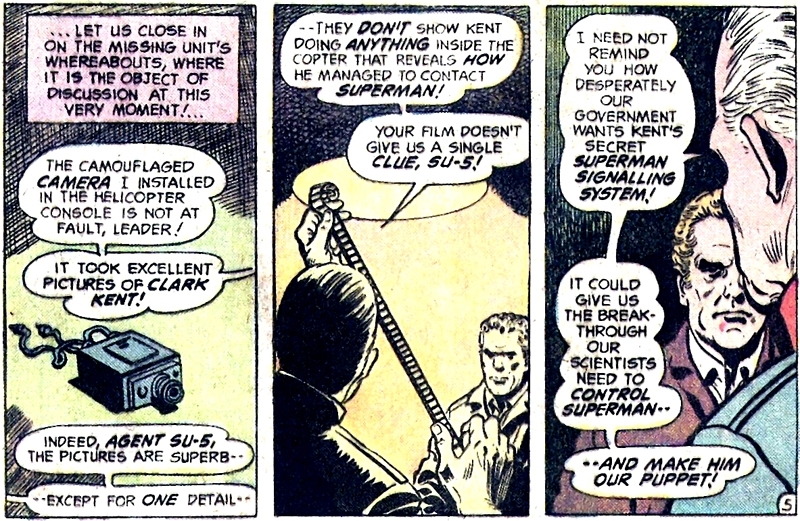 Plus, Lois is ignoring Jimmy Olsen's signal watch, which if you've read comics, was never ever used to tell time. 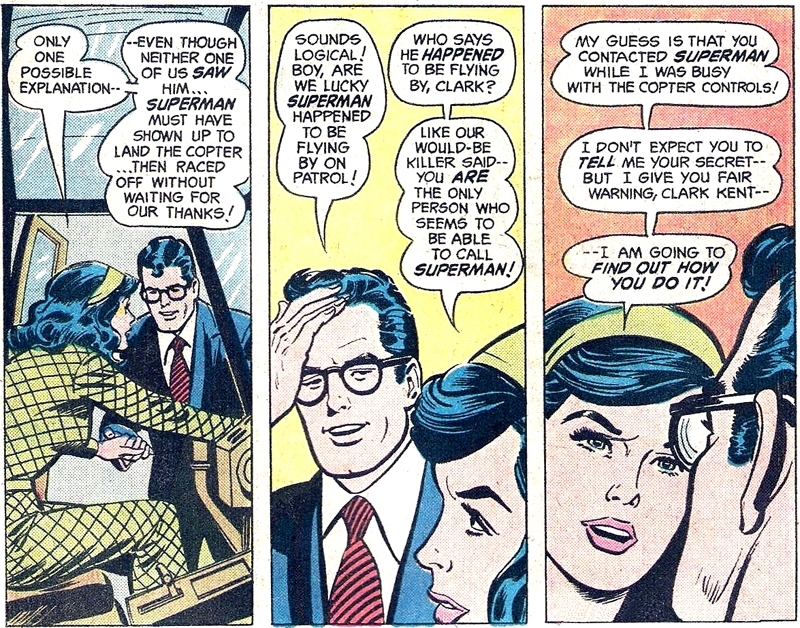 Sportingly, Lois tells Clark she will find out how he contacts Superman. 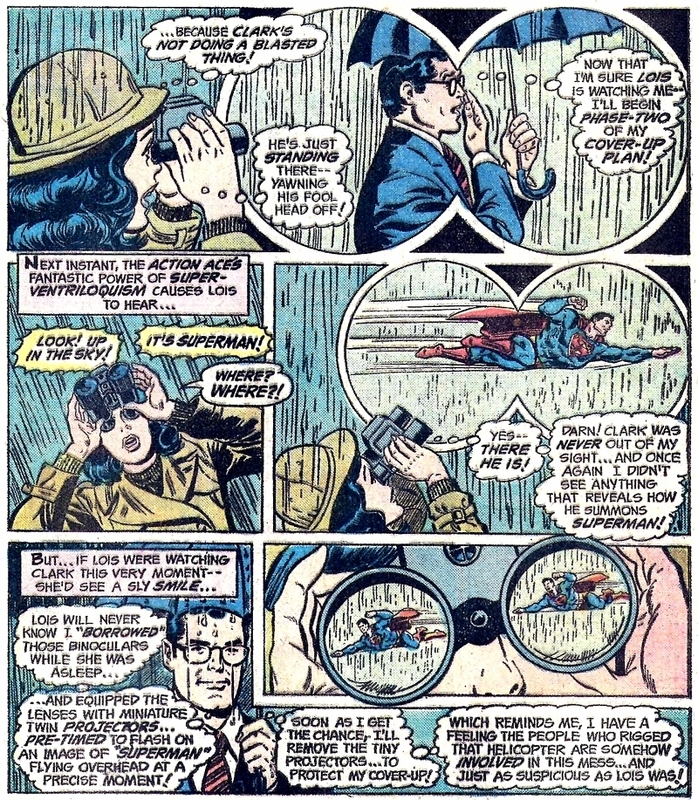 Lois borrows a pair of x-ray binoculars to spy on Clark. Lois has been reading and believing the ads in comic books. The Russians 'borrowed' her binoculars to add a camera. Clark 'borrowed' her binoculars to add a projector. I 'borrowed' her binoculars and added a Starbucks, and I don't even drink coffee! 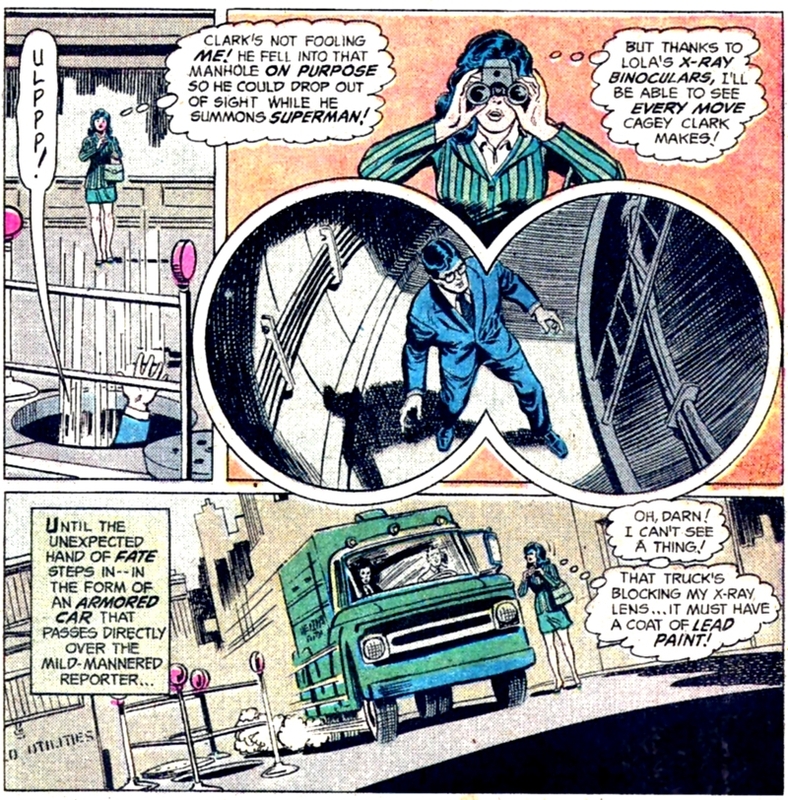 Lois sees Clark in the alley and then sees Superman flying due to the projectors in the binoculars. Projectors. She looks up in the sky and sees Superman. She looks at the brick wall in front of her and sees Superman. She can't be a Pulitzer-winning reporter and an idiot. She sleeps through Superman removing the projectors. She sleeps through the Russians removing the camera. And she sleeps through me removing the Starbucks. Curt Swan provided the interior art for Action 446 back in 1975. The binocular views are great. Bob Oksner did the cover (the first picture). Cary Bates told the story, which ended with Lois concluding that Clark contacts Superman by running “a hand through his hair -- a special chemical makes the hair give off a unique vibration that alerts Superman wherever he may be.” Right Lois. You figured this out because of a curl on Clark's forehead?!? Ira Schnapp designed the Action Comics logo and refined the Superman logo. Superman comics have been around for 80 years. That's a lot of stories. Comics are (mostly) monthly, so 80 times 12 is 960 times two (Action Comics and Superman Comics) equals 1920. And for a while, Action Comics was weekly. 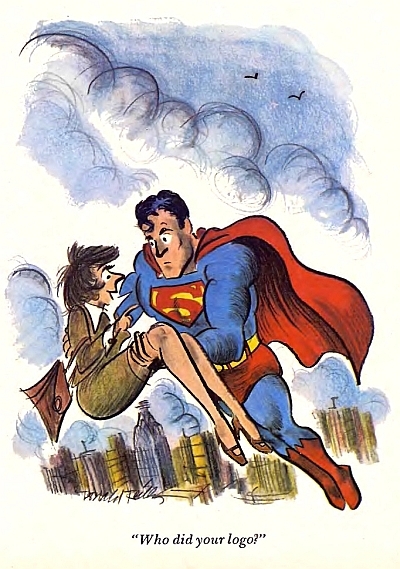 Plus Superman appeared in issues of World's Finest, DC Comics Presents, Superman Family, Superman's Pal Jimmy Olson, Superman's Girlfriend Lois Lane, Superboy, Justice League, Legion of Super-Heroes... Superman has been in thousands of comics. The problem with many Superman stories is writers (running out of ideas) who take away his powers, taking the super out of the man. Or they make him evil, taking the hero out of him. Either way is a writing cop-out. They aren't writing Superman. There are no limits to Superman stories, but there should be two limits on Superman writers. 2. Keep him a hero. If I were writing Superman stories, he would be as inspirational a hero as my heroes. He might make mistakes. He might not always seem to be the greatest hero, but it would be clear he would be looking out for the greater good. He would be giving and kind. He would work for a better tomorrow that wouldn't need his help. He would be willing to be shot at or put in jail for his convictions. He wouldn't be seen much. He wouldn't want his name on things. He wouldn't look for gratitude or wait around for a thank you. He would seem invincible and invulnerable, but everyday things and everyday people (and situations) can be made of Kryptonite, you know? There would be no end to the stories because I would draw on the greatest inspirations, people like Jesus Christ and the Rev. Dr. Martin Luther King Jr.
Other inspirations would include Malala Yousafzai, Nelson Mandela, Mohandas Gandhi, tank man, and some people you probably don't know. Fifty years ago today, the Rev. Dr. Martin Luther King Jr. was assassinated. He was 39. When winter seems to be a never-ending saga of snow with colder-than-Arctic temperatures, I put on my thermals and spring into Action. I am the shoveling Superman. The zipper broke on my shoveling coat long ago; the wind billows it behind me. Snow can be tough... a real villain. The trick is getting it away from the paths of mild-mannered citizens. Sometimes snow shoveling must be carried out carefully. Other times I quickly scoop the snow load and fling it over my shoulder and scoop up the next load before the last load has landed. That's fun in a Supermanish way. Moving fast without moving too fast is a trick. Moving too fast is easy -- all you need is ice to become a red blue blur. Your feet are no longer touching the ground. You're flying. Flying is also easy. Flying purposefully and landing upright? That takes finesse. And the few times you really get it right will be great. No one will see.